Untitled (Fountain and Hollyhocks) (Mission Garden? ), 1920s? Oil on canvas, 32 x 30 in. ; signed l.r. "Carl Schmidt"
Not to be confused with Karl Schmidt (1890-1962), Carl Schmidt was raised in the Midwest and studied at its most famous art school, the Art Institute of Chicago. In 1924 he moved to San Bernardino, half way between Los Angeles and Palm Springs. There he painted a variety of subjects from still lifes, to portraits, and religious and historical genres, as well as landscapes, primarily of the desert or of Western themes, such as Indians, cowboys, etc. 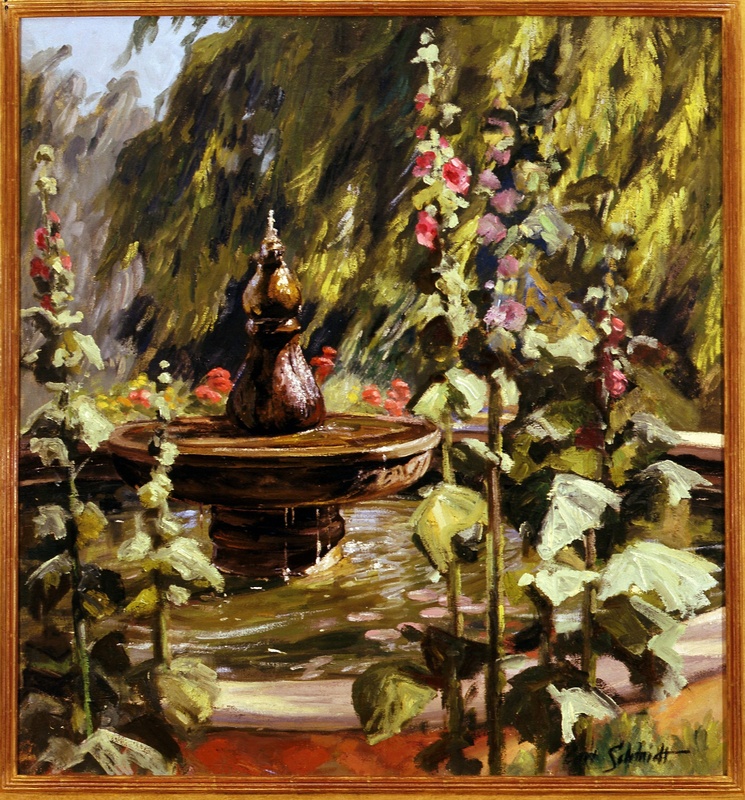 Untitled, depicting an as yet unidentified fountain, possibly somewhere in the inland empire, is a cross between a landscape and a still life in that it is an “arrangement” of the live foliage and the inanimate fountain. Schmidt’s loose brushwork is Impressionistic but is descriptive enough to depict botanical differences, as in the foreground hollyhocks and the background deodar cedar.